2013 Lake of the Ozarks Vacation Guide | Crystal Water Villas Blog - Lake of the Ozarks! We always say that summer at the Lake of the Ozarks is meant for making memories. Staying at any of our gorgeous properties, you can be sure the whole family will be comfy and feel at home. But once you get settled it, it’s time to get out and about. There are hundreds of activities to do at the Lake of the Ozarks. It all depends on how adventurous you’re feeling! 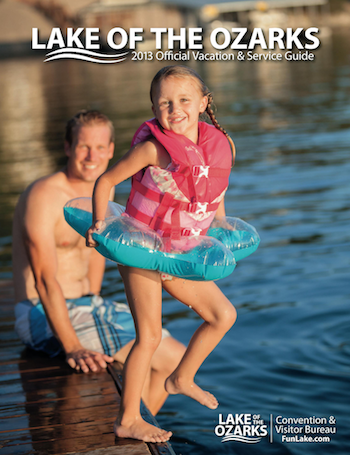 Be sure to check out out Local Area Guide and the 2013 Guide to the Lake of the Ozarks! From water slides to horseback riding, shopping, boat rentals, and more, there is really something for every couple, family, or group of friends. Please give us a call at 1-866-273-2169 or leave a comment on our Facebook page if you need any suggestions about what to do at the lake.